A group of criminology students have drawn the ire of netizens after they were spotted not wearing helmets while riding their motorcycles. 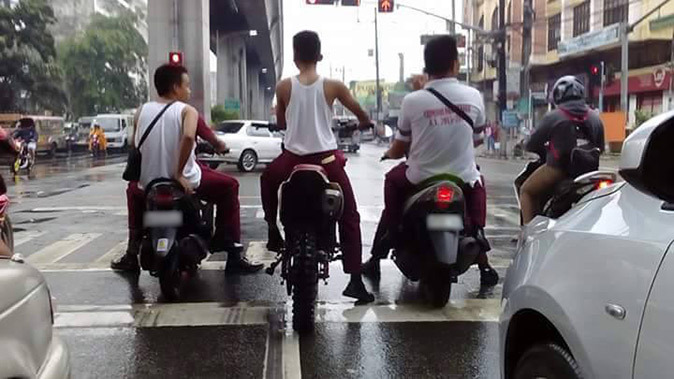 The Pinoy Rider Facebook page posted a photo of the unidentified aspiring policemen which proves that they clearly violated the law. Republic Act 10054, also known as the "Motorcycle Helmet Act of 2009," mandates all motorcyle riders nationwide to wear standard protective motorcyle helmets while driving. Mandatory Use of Motorcycle Helmets. - All motorcycle riders, including drivers and back riders, shall at all times wear standard protective motorcycle helmets while driving, whether long or short drives, in any type of road and highway. Any person caught not wearing the standard protective motorcycle helmet in violation of this Act shall be punished with a fine of One thousand five hundred pesos (Php1,500.00) for the first offense; Three thousand pesos (Php3,000.00) for the second offense; Five thousand pesos (Php5,000.00) for the third offense; and Ten thousand pesos (Php10,000.00) plus confiscation of the driver's license for the fourth and succeeding offenses. If these criminology students do not obey the law, then they don't deserve to become cops.